Our clients are always teaching us. In this case, our clients had a vision that changed the direction of the design process midstream. Often our clients tell us they have trouble visualizing. This time, we must admit, we had a little trouble visualizing how their big idea was better than what we were planning. And then, it clicked! 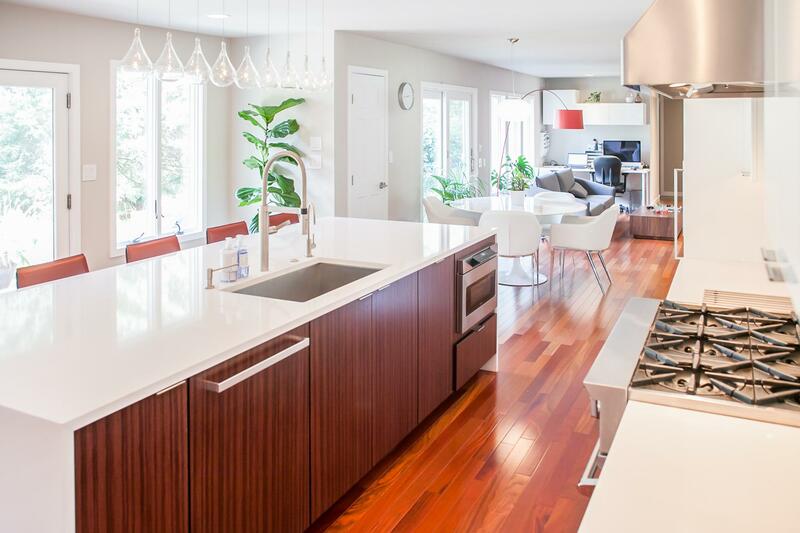 This young family of five had outgrown their dark and dated kitchen. 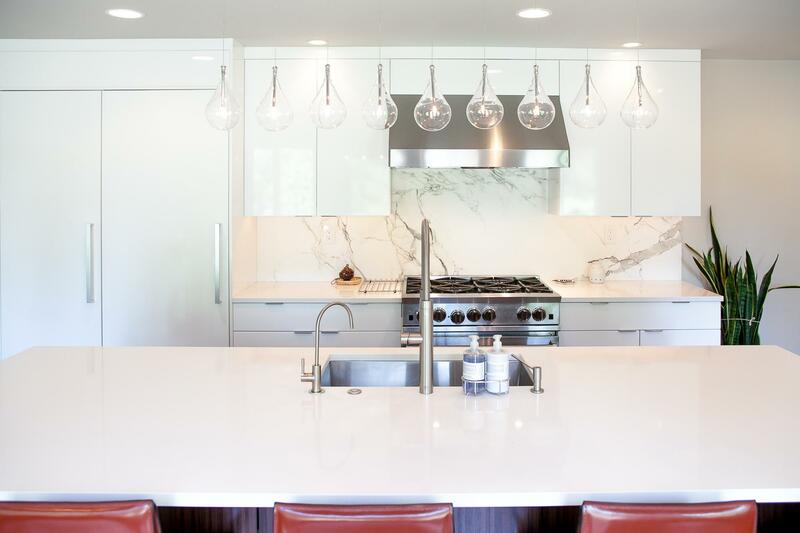 Food prep, cooking and baking play a large daily role in this home. Pantry storage was overflowing to the point where bulk ingredients, small appliances and other daily necessities were stored in a nearby closet and the laundry room at the end of the house. Counter space was scarce. The kitchen also served as an office area for the husband, who works from home, and a study area for the three school age children. Given some constraints and a fixed budget, our inclination was to work with the existing kitchen to design a much more efficient space, keeping it close to the laundry room/pantry, which could be maximized for convenient storage and access. We would create an organized work area within the kitchen as well. Our clients were happy with the design. Then, out of the blue, they announced that they would like to move the kitchen into the family room space! Our first reaction was to question how this could work being so far from the pantry storage areas, and the other living spaces of the home. The flow seemed as though it would be odd, but we heard them out and allowed some time for the idea to blossom. And blossom, it did. The existing kitchen and eating space became the new study and family room with enlarged windows and an added sliding door bringing their beautiful gardens into clear sight. 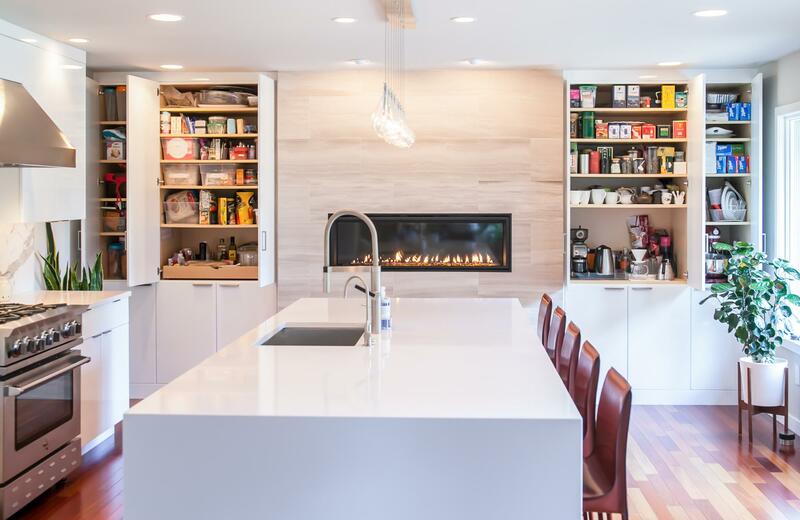 The pantry dilemma was solved by adding a full wall of tall cabinetry with roll out storage flanking a beautiful fireplace. 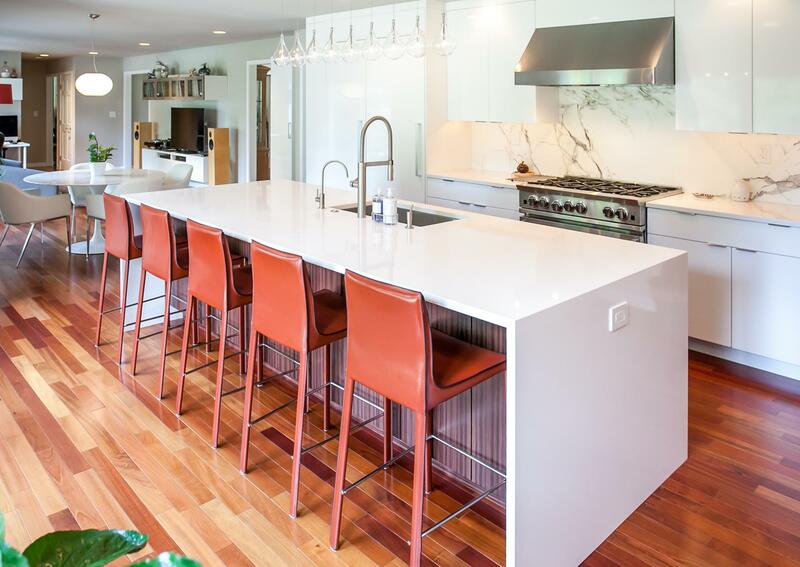 A large island with waterfall sides provides copious counter space and seating for the whole family. 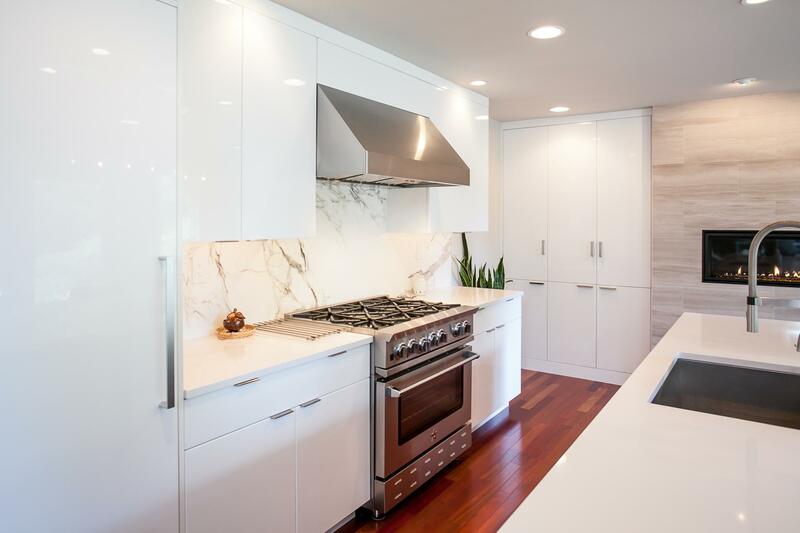 Dark, dated traditional styling of the past kitchen gave way to contemporary high gloss white and warm rosewood elements. 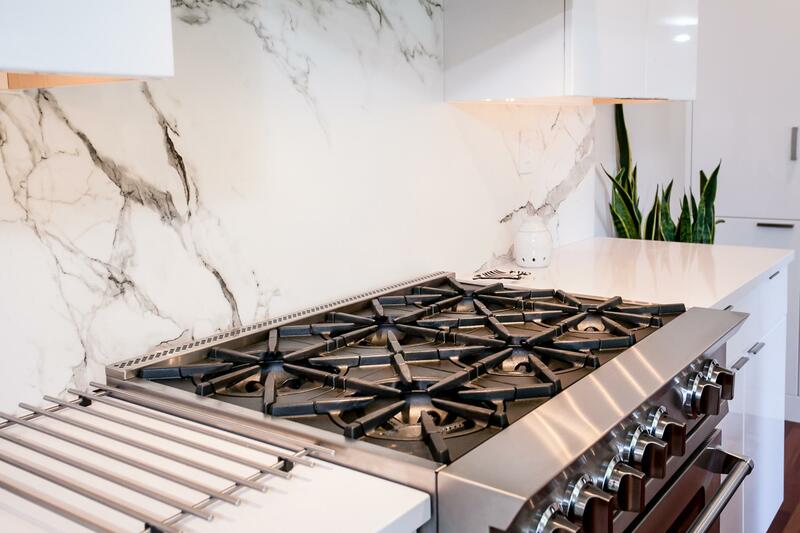 The dramatic Dekton Aura backsplash is the icing on the cake! 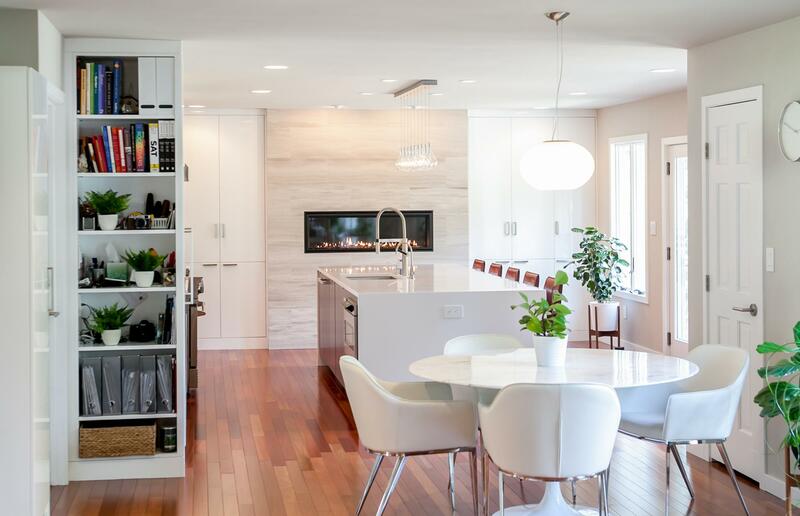 "During our year-long renovation process, They patiently guided us through the remodeling process. We changed our kitchen designs multiple times. 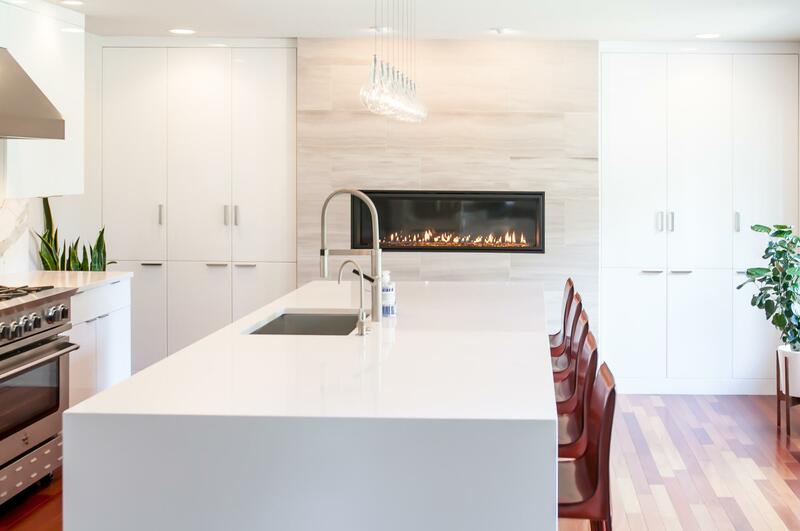 We went from a transitional style kitchen, changed to a new location and ended up with a contemporary kitchen. They are experienced, creative and detailed-oriented, which made us feel comfortable throughout the renovation."